Especially three developments appear to have caused Wilders’ “defeat” in the election. Still, the next Dutch government will chose a centre-right course on social-economic, climate and immigration policies. Prime Minister Mark Rutte labeled the Dutch elections of March 15 2017 as the quarterfinal in the battle against the “wrong kind of populism”, with the French and German elections, where the Front National and the Alternative for Germany might score well, being the larger matches. Three months before the elections the Freedom Party of Geert Wilders was the largest party in the poll of polls. Pro-European parties would only retain a small majority. National and international media speculated about a Nexit referendum. On election day, the Rutte’s Liberal Party was the largest. Together the pro-European parties hold a 60 percent majority in parliament. How did the pro-European forces beat the “wrong kind of populism”? Despite not ending up as the largest party, the Freedom Party picked up five additional seats in parliament (out of 150). Three elements in the campaign appear to underlie Wilders’ “defeat” in the election: the absence of Wilders in the televised debates, the expulsion of a Turkish minister by the Rutte government and the success of a new radical right-wing populist party. Wilders has a strained relationship with the traditional media. He prefers to communicate through social media and he has given larger interviews to right-wing media such as De Telegraaf. In the lead up to the elections four major televised debates were scheduled: two debates with the five to eight largest parties, a one-on-one between Rutte and Wilders and a final debate on the night before the election in which fourteen parties were given a podium. Wilders refused to appear in the first two. In this way, he allowed the Christian-Democratic leader Buma and Prime-Minister Mark Rutte to speak to undecided voters. 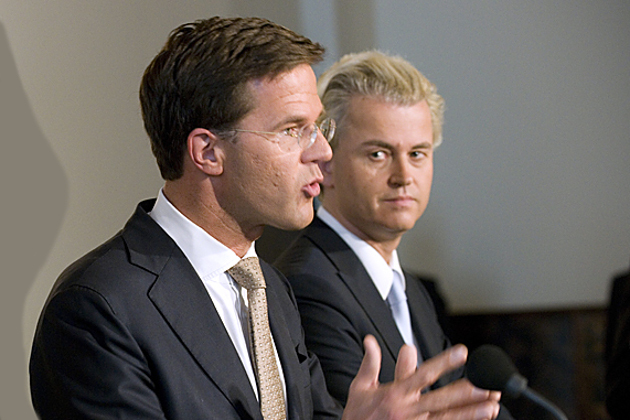 They both chose to veer clearly to the right on issues of immigration and national identity during this campaign: in a larger printed ad at the start of the campaign, Rutte wrote that he felt that people who harass gay people, shout at women wearing short skirts or who call normal Dutch people racist should leave the country. On the issue of European cooperation as well, the Liberal Party has also become more conservative. Unlike many other pro-European parties, however, the Liberal Party would like the European Union to focus on trade and little else. The EU should focus on its core business and it should not make “unnecessary role”, “waste money” or “interfere on issues that we can take care of ourselves”. Wilders banked all his money on a one-on-one televised debate before the elections between him and Rutte, three days before the election. It was hyped as the “prime ministers’ debate”. By then however the distance between Rutte and Wilders was so large in the polls that it was clear Rutte would win. Moreover, so many parties had announced that they would not govern with Wilders that he had no realistic path to the small Prime Minister’s office. Rutte did not just show his conservative side in the election debates and printed ads, but also as Prime Minister. In the weekend before the election the Turkish minister for Family Affairs, Fatma Kaya, wanted to speak to a rally of Dutch-Turkish people to advise them to vote in favour of the new Turkish constitution in the upcoming Turkish referendum. The Dutch government declared her an unwanted alien and expelled her from the country. The action led to civil unrest among Dutch Turks and protests from the Turkish government. Not only the Liberals and the Christian-Democrats profited from the virtual absence of Wilders in the campaign, as did Forum for Democracy, a new radical right-wing populist party, born out of the referendum campaign against the EU-Ukraine association agreement. Unlike Wilders, its leader, the young “intellectual” Thierry Baudet was very willing to appear in talk shows. His party, which also advocates a Dutch exit from the EU, tougher controls on immigration and more direct democracy, won two seats. All in all, Wilders’ campaign was invisible, allowing the new and old right-wing parties to court undecided voters with conservative views on issues such as immigration, national identity and civic integration ,with right-wing rhetoric and actions. The path to a new government is clear: the parties of the centre-right, the Liberals, the Christian-Democrats and Democrats share an overlapping agenda on the social-economic issues that despite the cultural tone of the election campaign will form the bulk of the coalition agreement. Together they are five seats short of majority. There are three possible paths to such a majority: they could be joined by the Labour Party (9 seats), the GreenLeft (14 seats) or the ChristianUnion (5 seats). As the Labour Party, which had governed with the Liberal Party in the previous term saw a heavy defeat (losing three-quarters of its seats), they are likely to prefer licking their wounds in the opposition. As the GreenLeft has major policy disagreements with the Liberal Party and the Christian-Democrats on issues like climate policies, economic policies and immigration that option also seems unlikely. The centrist ChristianUnion is much closer to these parties and has strong personal bonds with them due to cooperation in the previous term, this government seems likely. The government will chose a centre-right course on social-economic, climate and immigration policies, with D66 and CU smoothing the soft edges of the Liberal and Christian-democratic platforms. The essentials of the EU policy of the previous government will remain unchanged: the government will seek to strengthen the European internal market and will support measures that are deemed necessary to maintain the Monetary Union and to limit the influx of Syrian and North African refugees.